The Scouts used to attend an Autumn camp on a regular basis (the county-organised Interlink) but this has not been held since 2004 so a District Scout activity camp was held at Bentley Copse over the first weekend in October. The camp was well attended by 57 scouts from all 6 groups in the District and 15 adults including all of the Scout leaders (although unfortunately one had to leave for another Scouting event after helping to set up camp). Paul Frame and Jonathan Gasson lead the pioneering activity. 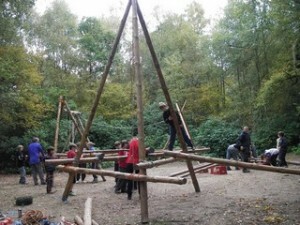 Over Saturday, other leaders, helpers and Scouts constructed A-frames and transformed them into a circular obstacle course by the addition of ladders, beams and ropes. Scouts also enjoyed archery, air rifle shooting, go-karts, orienteering, a camp fire and a wide game as well as exploring Bentley Copse and making new friends. Richard Cant kept everyone fed with 180 eggs, 140 sausages, 2 vats of Bolognese, mounds of pasta and piles of other stuff loaded into 3 supermarket trolleys and wedged into a car on Friday. He commented that he should be awarded his camp cooking badge and asked who was cooking at next year’s camp – any volunteers?